Sturdy bracelet with an engraved picture. We engrave by hand names, words or dates, extra personal! ♥ The picture (about 24 x 12 mm) is made of Stainless Steel. 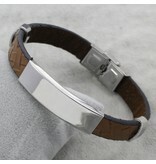 ♥ The stainless steel material is not discolored. ♥ Available in several sizes. ♥ Handcrafted manually engraved in our studio with an engraving pen. The engraving is subtle and not "mechanical candle" but literally handwritten by Tanja. ♥ Luxurious wrapped in a pink silk jewelry buckle, equally ready for gift!